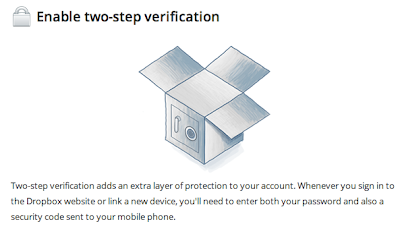 Like many online services (including Gmail), Dropbox has also received a two-step verification feature for added security for your account. It is an opt-in feature that can be enabled from your account settings. When enabled, two-step verification sends you a code on your cell phone when you try to log into your Dropbox account from a new, unverified device. 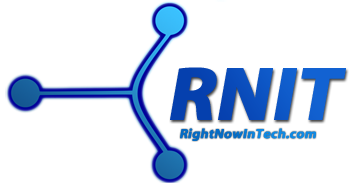 You can sign up to receive a code in a text message to verify your new device access or you can use a mobile app such as Google Authenticator. 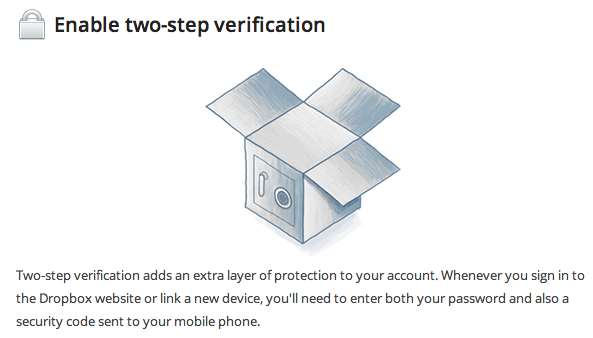 Two-step authentication helps protect all that sensitive data you store in your Dropbox. If you enable it and set up your cell phone, it will be nearly impossible to hack into your account without access to your phone. Read details on how to enable it here. Turn on the feature from your settings page over here.